"I always knew I'd find something amazing with that metal detector someday." No Billy I said we were going to Ryde. Dave was glad of a walk because he was a bit saddle shore. John was convinced he was told it was a beautiful pedal beach. He didn’t know which bike to bi, because he couldn’t be shore if he related more to male or female. 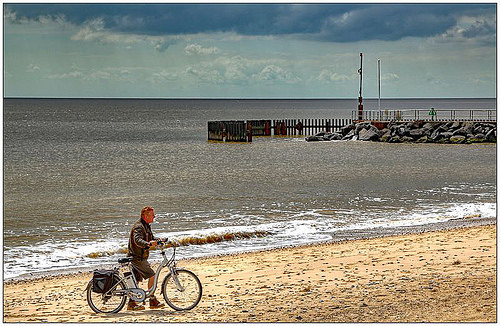 "The sand is far too soft to cycle, yet my dad said the local bicycle could always be seen on this beach." "No, darling, I said let's hire a pedalo." You can't have a peaceful day on the beach any more. There's always some pedaller trying to sell you something. Anyone who thinks they can use their bike on a beach is a cycle-path. Norman Tebbit's dad is still out of luck. Having taken a massive run up to the new 'waterfront bike arch' Mike landed safely in France. Braindead Harry decided to push the bike he had just pinched. As he didn't want to get done for pedaling stolen goods.